Anyone who has attempted to draw a weapon while sitting will quickly understand the optimal value of an ankle holster. When worn on inside of the opposite leg of the dominant hand, the draw from an ankle based holster can be faster and more fluid than any other body locations. If you consider the logistics of retrieving a weapon from a hip mounted holster while sitting, it’s very easy to see how a holster at the ankle can be beneficial in these cases and everyday situations like driving. If there is concern about a weapon being taken or stolen, the risk can be substantially lessened by the use of ankle holsters. A gun is rather easily snatched from a hip or shoulder rig, and of course guns worn on the outside of the thigh are an easy target for enemies or thieves. A quick search on the internet will quickly show that most states are showing a rapid increase in requests for concealed carry permits. Be it the political reasons or concerns over the growing dangers in society, the desire for greater safety is apparent. But once the paperwork is completed, most of the people are getting confused on exactly how to conceal their weapon. Although there are several options to choose from, many people opt for a high-quality ankle holster due to its comforts, ease of concealment, and affordable price. Traditionally, Ankle Holsters are considered one of the best options for secondary firearms (in some cases, a third or fourth firearm). This backseat position to shoulder, chest, hip and thigh holsters is due to the fact that there are fewer places where a gun can be carried are less convenient than the ankles. 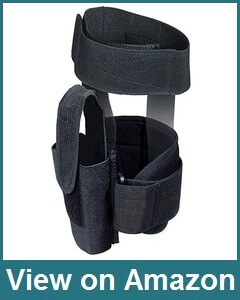 In looking for a quality ankle holster, a good place to begin is the UTG Concealed Ankle Holster. A versatile holster that fits all compact and subcompact guns, the adjustable design makes it ideal for nearly any user. The build quality of the product is great, being made from strong nylon with an adjustable elastic holster. The padding provided, not only on the holster but in the two wraparound straps help provide both comfort and support when used for longer periods of time. 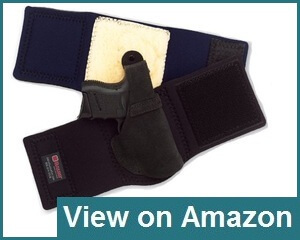 By padding the supports, the weight and pressure of the wraps are greatly reduced, making the holster comfortable to wear for an extended period of time. The holster itself is flexible enough to fit most guns, and even allow for any laser attachments. The key to this great design is indeed in the double strap option. 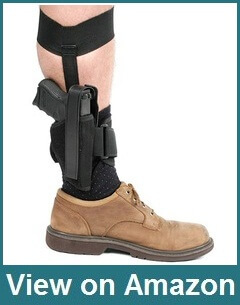 The higher calf strap provides enough support to keep the ankle holster from sliding and sharing the weight of the gun through the holster onto the lower strap. There are also two vertical straps running from the top to bottom straps to give a better sense of security, and to keep the gun motionless while walking. There can be few things more painful and annoying than having a gun bang constantly against your ankle while you walk, and the UTG secures that problem. The UTG concealed ankle holster is a great option for someone who has just begun their concealed carry with smaller guns like pistol or revolver and needs to carry for longer periods of time. Uncle Mike’s Law Enforcement Kodra Nylon Ankle Holster is very similar to the UTG ankle holster mentioned before but more robust with various size options to choose from depending on the type and size of gun carried and the ankle size. With an affordable price range, this holster also has a double strap support for better security and comfort. With both left and right handed options are available so that the user has a choice of which legs to use. And, with a larger holster option, there are much fewer limitations on the gun size. This is the key someone needs to pay attention so that he or she can select the correct size when ordering. Using a soft knit fabric, Uncle Mikes Ankle Holster can actually be worn comfortable and has a cell foam padding that acts as a moisture barrier as well. 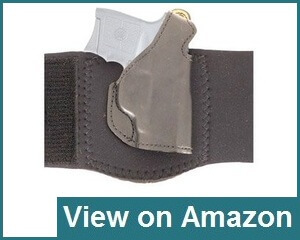 Like the UTG, this holster can easily be worn all day long with a maximum level of comfort. And with a reinforced thumb break, the gun is secured in the holster, but able to be accessed when needed. 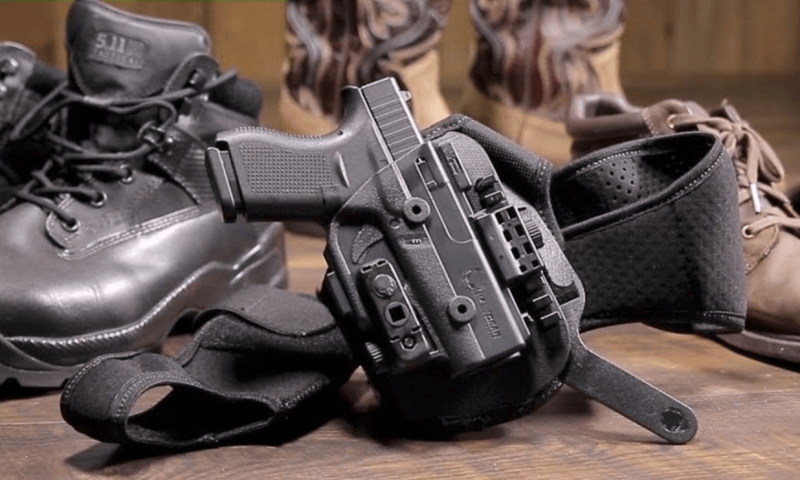 This holster only has a single vertical strap but still, it provides a larger lower wrap for greater support around the ankle. By allowing for at the larger bottom wrap, Uncle Mike has allowed for larger and heavier guns to be carried comfortably. This holster is better designed for those in the security or police field. This does not mean than an avid gun enthusiast should not or could not use it, but that it is a rather hefty ankle holster for larger guns. The increased cost is well worth the expenditure for an increase in comfort and stability. And rather than being limited to a compact or subcompact gun, the carrier is free to use a gun that offers greater stopping power. However, if you plan to carry ankle holsters for revolvers with a barrel longer than 3”, or larger caliber pistols, the Uncle Mike’s option is the way to go. And given the affordability of the holsters, this option of concealed carry is a viable way to go on any budget. It provides a discrete, lightweight concealed option for any gun. Ankle Holsters are considered one of the best options for concealment, and one of the worst, depending on attire. The J Frame Ankle Holster from Fobus makes this conundrum a bit less challenging. It’s an incredibly flush and low-profile option that promises to provide rapid deployment along with submissive retention. While sheepskin is a commonly used material for the internal pad linings of ankle holsters, the Fobus option eliminates some bulk by using a suede lined pad inside. This provides for softness without added bulk. This material combination also adds stability to the lightweight rig. Some users have experienced disappointment with the J-Frame notation given the name of this ankle holsters. While considered a J-Frame S&W, the Bodyguard .38 may not work with this holster. It’s worth noting however that some older models may work well with the J frame ankle holsters. It’s best to check with the seller of the holster if inquiring about certain weapon makes and models, especially 4” barrels, which can be hit or miss with this rig. Fobus fans have long been used to the wait times associated with receiving their products from overseas, if applicable. However, for new shoppers, the lead time to receive a holster from Israel may be an unpleasant surprise. It may take a few weeks for the rig to arrive, and in some cases even longer. The Blackhawk ankle holster is made from lightweight, soft and durable fabric combined with a comfortable foam pad that makes the rig suitable for long term wear. A retention strap that is free from stretching along with a molded thumb break makes the holster heavy, although some research may be required to ensure that the right holster is being purchased for a particular firearm. 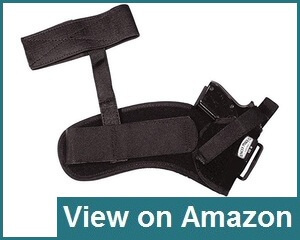 It’s absolutely essential to check with the manufacturer before buying this ankle holsters. Some users have been left disappointed after buying the rig thinking that it would fit their Ruger sr9c, only to find out that a snug fit was not to be found. Since nearly a dozen size options exist, it’s best to identify which is best for the primary weapon that you are planning to secure in the holster. Unlike many ankle holsters, the rig is not pre-molded to one specific gun. As such, many weapons may fit just fine, while others may not be snug or may not fit at all. However, the manufacturer notes that the Blackhawk Ankle Holster is especially suitable for 2″ barrel small frame 5-shot revolvers. The majority of users find the Blackhawk ankle holsters to be lightweight and comfortable. However, it lacks some of the higher-end materials that other rigs offer. Prices for the ankle holster vary wildly with size specifications, with the greater range reaching over one hundred dollars. It can be argued however that with this larger price tag comes greater versatility for a wider range of weapons, making it not a one gun holster. Some users who may want to use the rig with other firearms may find this appealing and a way to add value to the holster’s purchase price. Featuring a design and materials that were originally combined to provide a premium product to those commonly in the line of fire, DeSantis has managed to make a tough yet luxurious ankle rig that is comfortable, durable and functional. Made for the S&W Bodyguard 380, the DeSantis Die Hard ensures that the firearm stays in place with as little notice to the wearer as possible. Saddle grain leather is most commonly associated with high-end upholsteries, but in this case, it’s the adorning material that comprises the piece’s holster. This provides for superior molding and concealment. When combined with the low profile neoprene cover, the result is a lightweight yet durable rig that stays in place without feeling bulky, awkward or uncomfortable. As if the Bodyguard 380 Ankle Holster didn’t already sound like a luxury car more than it does a gun holster, there are options that can be added to the piece as well. Buyers can select from both a boot extender and a calf strap in addition to the basic Desantis ankle holster. For many users, the additional items may hold little value and won’t do much else than inflating the holster’s cost. However, many do find that having the boot extender or calf strap can be very useful in certain situations. Regardless of options selected, all buyers benefit from the rig’s fast thumb break for a rapid requirement and smooth draw. Comparatively newer to the market and considered an updated follow-up to the popular ankle glove model, the Ankle Lite Holster from Galco capitalizes on the success of their concealed carry lite family of products, boasting the same popular combination of velcro straps and neoprene that popularized the line. Users of previous Galco ankle holster products will be familiar with the fit and feel of the ankle lite. The internal lining is fitted with sheepskin, making for an almost luxurious, comfortable experience. The rig comes from less than girthy lower limbs, and skinny legged shooters have found that the holster suits them as it does with larger legs. While Galco has taken comfort for the wearer into consideration, the weapon the holster secures tends to receive a snug and cozy experience as well. Center cut steelhide comprises the holster that some users, like those are looking for a Ruger LCP Ankle Holster, have found may be a little tight at first. It may seem a nuisance, however, it’s perfectly normal. 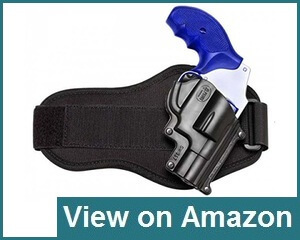 The product is well designed to serve as an LCP ankle holster. The initial tightness some experience is a result of the new leather, and with a bit of use, the snug and secure fit become closer to perfect. The Galco name is a popular one amongst those that are hoping to achieve the most bang for their buck. Known for premium materials and comfort paired with affordable prices, Galco has mastered the art of combining function with form. For those interested in an Ankle Holster for Ruger LCR models, the Galco Ankle Lite Holster is an excellent choice. Product improvements from the Galco line include a thumb break retention strap, which creates a faster draw. While the size of the firearm is important, so is the body part it’s attached to, at least in terms of holsters. The Galco ankle lite holster provides generously in this regard and is able to comfortably fit ankles up to thirteen inches in circumference. Able to accommodate semi-automatic guns and some revolvers with ease, size plays another important role in the function of the Galco ankle lite in terms of pants, yes pants. Many users have found that while looser pants provide the ultimate in concealment, even those who prefer a snugger fitting jean will find the rig virtually undetectable. Although, it’s worth mentioning that the tighter the pants obviously the more challenging a quick draw will become. The sheepskin lining of the rig makes the Ruger LCR holster feel lavish and even fleece like, however, there is one component of the leather holster that some find challenging, and that is the break in period. While perhaps a trade off for quality materials, it’s been suggested that it takes a bit longer than expected for guns to mold properly to the holster and fit snugly, but not too tightly. This phenomenon is not uncommon in ankle holsters, however, and most find that their firearms fit fine from day one with nothing more than added comfort to come down the line as the gun becomes homed in the rig. From other perspective, an ankle and/or foot holster have some limitations. It provides nearly no benefit in terms of speed or stealth, and retrieving weapons from down low rigs can take more time. Even the best ankle holster may provide some jiggle issues while running or moving around. Another problem is commonly cited in an ankle holster is the comfort and wear. 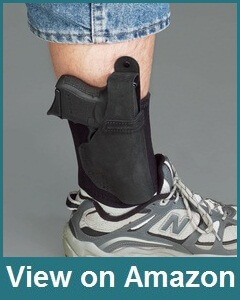 The ankle can be an awkward place to put the weight of a gun and some users find the entire situation uncomfortable. Weapons carried in ankle holsters are much harder to steal. By nature, the ankle holster always provides the optimal concealment and work as one of the best carrying options for a backup weapon. In situations where sitting or driving is involved, no other holsters can give you such a confidence like an ankle carry holster. Click here to review most comfortable shoulder holster in detail.